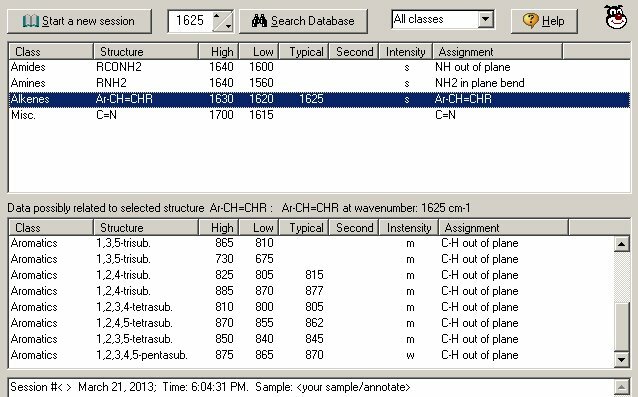 The infra-red spectrum of the Morgellons oral filament sample in Nujol (mineral oil) on a KCl Real Crystal(TM) card and the interpretation/annotation (working notes) of its fundamental molecular and chemical composition. The structure of the filament form appears to be, based upon the best available information to date, primarily that of an “polycyclic organo-metallic halogenated aromatic amine”. Substantial evidence also exists for the coupling of a iron-amino acid (cysteine and histidine dipeptide complex). The implications of such a compound and structure upon human health are profound. 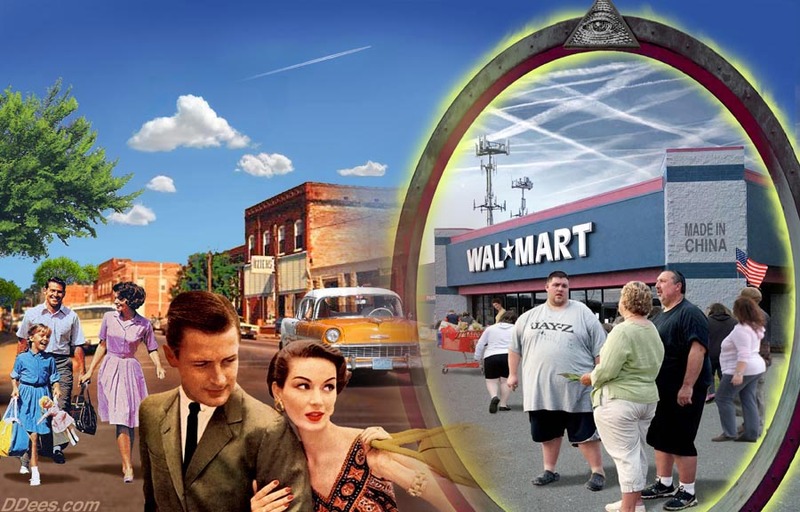 The recently acquired spectrum that is shown above, along with all previous research to date, will be important in supporting the conclusions that are presented here. Before we begin with the detailed analysis of this infrared spectrum, let us recall briefly what has already been established with respect to the growth of the structure. It has been established, through rather painstaking processes over a period of several years, that primary constituents of the growth form are comprised of both iron and amino acids. The methods to achieve this have been described in detail on previous reports. The essence of impact to health has also been discussed at length, namely, that if these elements are used by the organism for its own growth then those same nutrients are being denied to the human host that supports the invasive growth. Your iron is at the core of your respiration and hence of all energy transfer within your body; proteins are the structural framework that allows your body to exist and grow. The absconding of both iron and amino acids (i.e., proteins) from the human body is by itself of sufficient damage to warrant a full and dedicated allocation of resources to this problem; this has not happened to date. This information has, however, been very useful to develop an entire host of strategies to mitigate this damage and these have been discussed on this site. There remains much to do. Unfortunately, the information that is now gleaned from the use of infrared spectrometry only makes the situation more serious and compelling. There is, however, great value from two standpoints with our current discussion. First, a more comprehensive portrait of the actual structure of the growth form is now established. This is an absolute necessity to understand the expected impacts upon human health, and this problem remains unfinished until the full complement of investigative resources, equipment and personnel are aptly dedicated to this problem, i.e, the “Morgellons” problem. Second, and of even greater importance, is that the primary mechanisms of compromise and damage to human health are now identifiable to a greater extent. Armed with this knowledge, there is every reason to think that more effective strategies of alleviating suffering and improving health are at hand. This has been and remains a primary pursuit of this researcher. The health and medical communities are required to assume their role to evaluate the veracity of this information and to implement any potential benefits that might result from this work. We now transition to the powers of infrared spectrophotometry, and what it can teach us about the current situation. To begin that process, let us devote a few words to the generalities of spectroscopy. One could easily devote a career to the study of this discipline alone; the history, the literature and the science itself is detailed and extensive. This speaks of the utility, value and importance of the methods. I will make no claim to being an expert in the field but I have applied myself in this, as well as dozens of other disciplines, to get certain questions answered in the face of urgency and need. An understanding of at least the basic science is in order. Spectrometry, in general, is the response of matter to electromagnetic energy. Spectrophotometry, in particular, is the reaction of matter to light waves, i.e., a specific and limited window within the electromagnetic spectrum. Furthermore, this light energy can be broken down into ultraviolet, visible and infrared light sections. When matter is subjected to the energy of the light source, it gets excited or vibrates. Depending upon the portion of the spectrum involved (i.e., visible, UV, IR) this excitement or vibration occurs in different forms. Carnicom Institute now owns both a modern visible light spectrophotometer and an infrared spectrophotometer (albeit aged but functional) and the public is to be commended for that accomplishment. Our focus within this paper is specifically infrared spectrophotometry (IR). Infrared spectroscopy is an absolute core and stalwart of biochemical study for the following simple reason : it can be used to identify organic molecules, i.e., the stuff of life (natural or engineered, for that matter..). Visible light spectroscopy is useful if whatever you are looking at has color; in practice it will be found that this has serious limitations. The majority of organic molecules are transparent and have no color; you can not see them with your eye. This correspondingly makes the process of identification inherently difficult. What happens in the infrared spectrum is that molecules vibrate in characteristic ways that are known, understood and catalogued and this is helpful in identifying what are called “functional groups” in the discipline of biochemistry. Functional groups are combinations of molecules within biology that have identifiable characteristics and behavior. As has been mentioned, infrared spectrometry can be a lifelong pursuit of study in its own right; there is no magic single button that gives one a printout of what something is made of. The “building blocks” of a biological structure can be identified with the use of IR, but it is unrealistic to expect complete and total knowledge of detailed molecular composition. There are databases built into modern equipment that can radically accelerate the problems and details of IR interpretation, but even these will not address many of the problems at hand. This is especially the case if we are dealing with unknown, newly synthetic or engineered substances or complexes. There is both art and science in the practice of IR spectroscopy and those expert in the field are to be commended for their own dedication to the subject. The work that I offer here will, hopefully, point us in the right direction and allow us to anticipate what we are trying to see at the end of the tunnel. 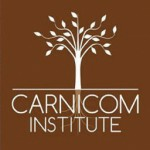 There are a host of other technologies (including additional spectroscopy methods) and instrumentation which could give us the level of knowledge and detail that is to our benefit and need; Carnicom Institute has no such access to what is truly needed at this time. Now we must dig a little deeper, and into the thick of it. For those willing to expand your study of the discipline I encourage you to do so. For those that have the knowledge already, it is time to bring our best foot forward and make the analysis. It is time to study the spectrum presented above. The instrument in use is a Perkin-Elmer 1320 Infrared Spectrophotometer, a dual beam dispersive IR instrument. 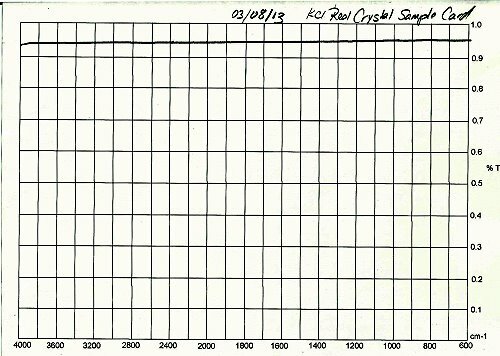 The sample substrate being used is that potassium chloride (KCl) in an International Crystal Laboratories Real Crystal IR Sample Card (TM). 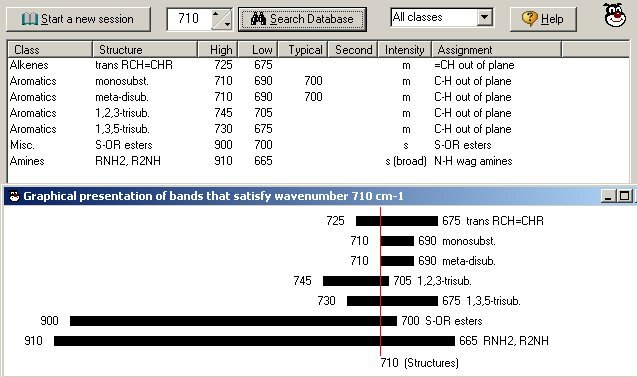 Considerable time has been spent with study of numerous reference spectra and the oral sample spectrum using a polyethylene substrate; the advantages of uniform transparency to IR with KCl are immediately apparent as they have recently become available. 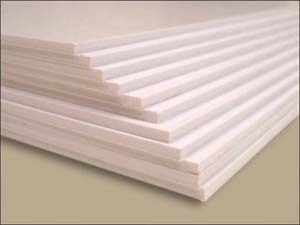 KCl is highly preferred in many respects as, for example, it is free from the interference of Nujol and polyethylene absorbances and the transmittance in the IR spectrum is also extremely high and uniform across the range of 4000 to 600 cm-1. 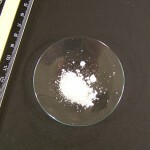 This substrate form is also unique in that it will handle a certain level of water in the preparation of the sample on the salt crystal. 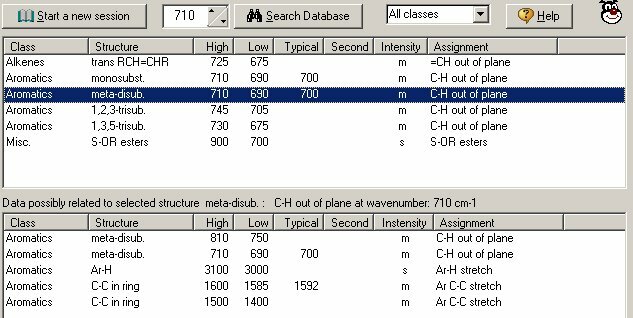 Example of the uniform transmittance of the reference KCl crystal as a sample substrate; an ideal IR material without interference absorption. 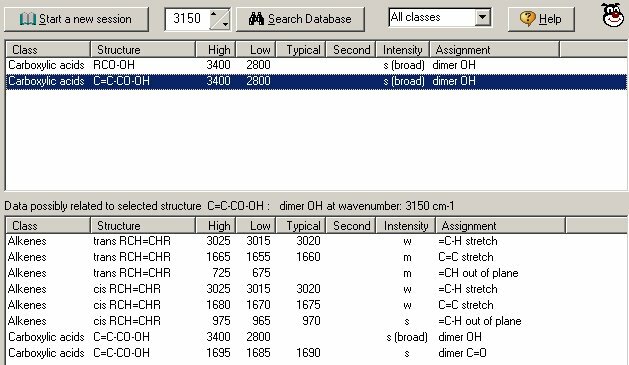 Reference IR spectrum of Nujol (mineral oil) on KCL plates. Nujol is a useful substrate for solid samples. 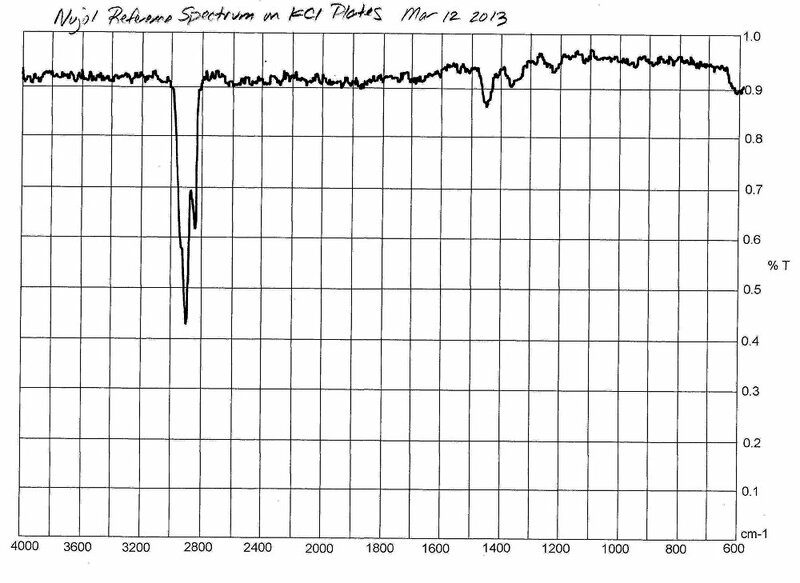 Notice the only significant interference absorption peaks will be at approximately 2900 cm-1 and 2850 cm-1. The initial method of analysis will focus on the use of IR Pal and correlated Nakanishi. The work will progress through a series of iterations: the first stage will identify candidate functional groups, a second stage will examine the candidates from a geometric-graphical perspective, and a third stage will examine cross-correlations between the candidate functional groups. The final stage will form from a composite of all three approaches, as well as integration of knowledge gained from previous research. The end goal will be to create a more comprehensive assessment of the expected structural-chemical composition of the growth form. A leading discussion into potential health implications will be initiated along with the call for continued research under urgent conditions. The functional group candidates here will therefore be carboxylic acids and aromatic phenols. The candidates list is restricted to carboxylic acid functional groups in this case. Our list of functional groups at the broad absorption peak includes alkanes and carboxylic acids. This introduces an aldehyde functional group for consideration. which leads to the consideration of a phosphoric acid group. This minor peak introduces the consideration of both aldehydes and esters. We also note the reference to the 6-ring structure, i.e., the possibility of aromatic structure appearance. 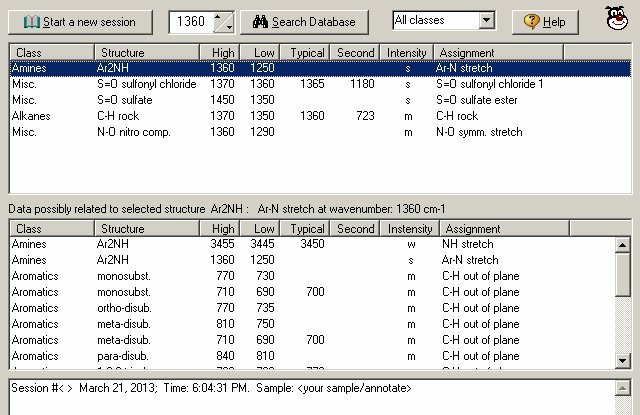 This search lists amides, amines, alkenes (notice aromatic reference again) and a C=N double bond structure. Our candidates here are a sulfate ester and, once again, an aromatic structure. Here we have the following entries: an aromatic amine, sulfonyl chloride, sulfate ester, an alkane group and an N-O (nitrogen oxygen single bond). Numerous candidate groups appear here: alkyl halides, ethers, amines, thiocarbonyl, sulfone, phospine, phosphine oxide, phosphate, carboxylic acids and esters. Here we have a listing of alkyl halides, phosphine, P-OR esters, Si-OR, carboxylic acids and esters. This set includes a P-OR ester and a carboxylic acid group. This final candidate list shows an alkene, a strong presence of aromatics, a S-OR ester and an amine. 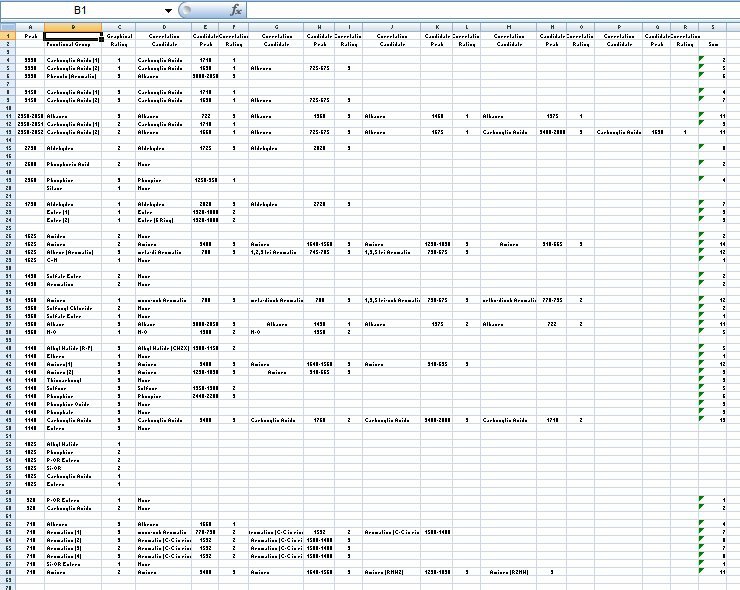 Our next phase of work is to begin screening, or filtering , the data that we have to work with as it can be a bit daunting at this stage of collection. We must be careful in this process, however, not to lose critical data along the way. The approach taken will be to look at cross-correlations in the data and to look for some of the patterns that may be stronger than others within the data set. Correlations identified will tend to strengthen the case for the existence of the group; they will be identified as weak, moderate or strong respectively. 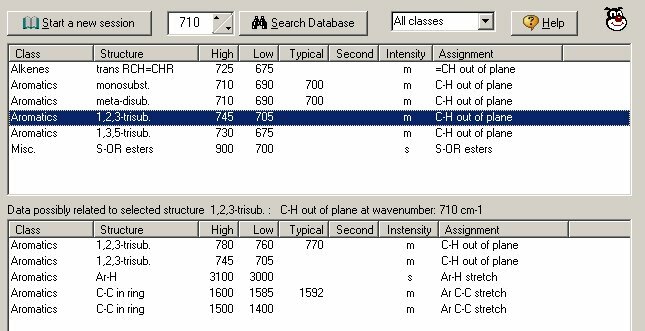 IR Pal infrared tabular software excels at this approach, and is to be commended as highly valuable software for assisting in infrared spectral analysis. Let us begin, and once again take each candidate absorption peak individually. Begin with the absorption peak at 3390 cm-1. With the first carboxylic acid group, correlations are suggested at approximately 1710 cm-1. Our closest peak here is at 1730 cm-1. The 1730 cm-1 peak is also listed as strong. This correlation would appear reasonably weak at this point, and this rating will be assigned tentatively at this time. The second carboxyl acid group shows a possible relation at 1690 cm-1, also listed as a strong peak. This correlation is also determined to be weak at this time. This same carboxylic acid shows correlations with alkenes at 3020, 1660, 725-675, 1675, 970 cm-1 respectively. Of this set, the 725-675 cm-1 of medium strength is of strongest interest, and will be assigned a strong rating. The remaining peaks do not indicate correlation with the 3390 cm-1 absorption peak. The phenol group indicates a correlation with an alkane expected at 3000-2850 cm-1. This will be rated as a strong correlation because of the observed broad and strong absorption peak at approximately 2950-2850 cm-1. A weak relationship may or may not exist with the carboxylic group at 1710 cm-1. Correlations of the carboxylic acid group with the alkene at 1660 cm-1 is rated as weak. The correlation at 725-625 cm-1 is strong. The correlation at 1675 cm-1 is weak. The correlation in the range from 3400 – 2800 cm-1 is strong, and the correlation at 1690 cm-1 is weak to marginal. No correlations are identified with the candidate phosphoric acid group. 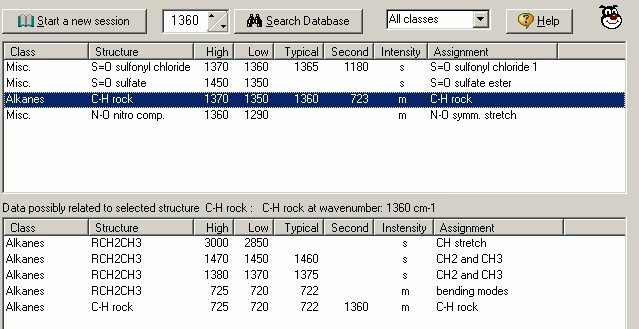 The phosphine candidate has a weak prospective correlation with the phospine group ranging from 1250 to 950 cm-1, based upon the observed absorption peaks at 1140 cm-1 and 920 cm-1. Notice the character of these latter peaks is listed as weak, however, and this is especially questionable with regard to the observed peak at 1140 cm-1. No additional correlation opportunities are listed for the silane candidate. The first aldehyde group has potential correlation to the aldehydes at 2720 cm-1 and 2820 cm-1, rated as strong. The ester group at 1735 cm-1 has potential correlation to the strong ester peak between 1320 cm-1 and 1000 cm-1, rated as moderate at this point with consideration of the sharp observed peak at 1140 cm-1. The amide group candidate shows no correlations of significance. 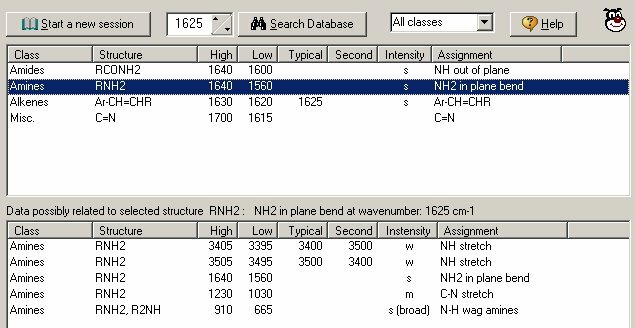 The amine group candidate shows amine correlations at 3400 cm-1, 1640-1560 cm-1, 1230-1030 cm-1 and 910-665 cm-1. These correlations are rated as strong. The aromatic alkene candidate group shows correlations to the meta-disubstituted aromatic at 700 cm-1, the 1,2,3 trisubstituted aromatic at 745-705 cm-1, and the 1,3,5 trisubstituted aromatic at 730-675 cm-1. 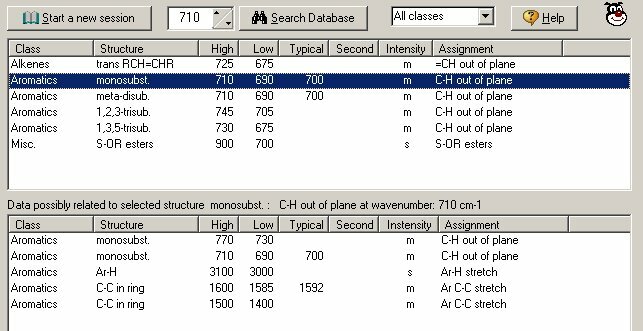 These are rated as strong from the observed absorption peak at 710 cm-1. 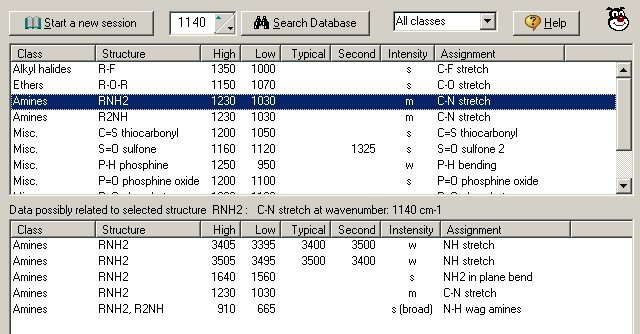 Here we have no correlations shown for the carbon-nitrogen double bond. We see that no additional correlations exist for the sulfate. The aromatic group also does not present any correlations of note. The amine group (aromatic) shows strong correlation to the monsubstituted aromatic at 700 cm-1, to the meta-disubstituted aromatic at 700 cm-1 and to the 1,3,5 trisubstituted aromatic at 730-675 cm-1. 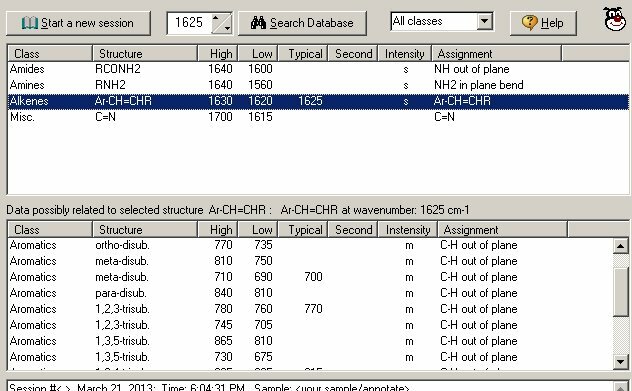 Moderate correlation to the ortho-disubstituted aromatic exists at 770-735 cm-1. 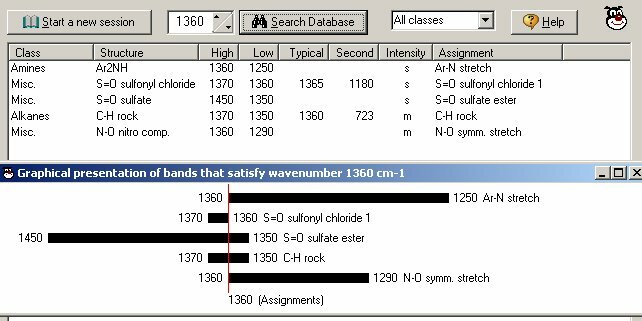 The sulfonyl chloride does not show any significant correlations; the observed peak at 1140 cm-1 is expected to be outside of the 1190-1170 cm-1 range and beyond the errors of observation. Similarly, the sulfate group shows no correlations present. 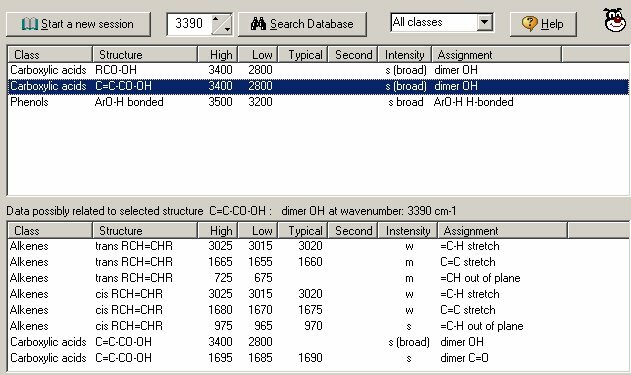 The alkane group shows alkane correlation at 3000-2850 cm-1 at a strong level. The correlation at 1460 cm-1 is rated at the weak level. The correlations at 1375 cm-1 and 722 cm-1 are rated at the moderate level. 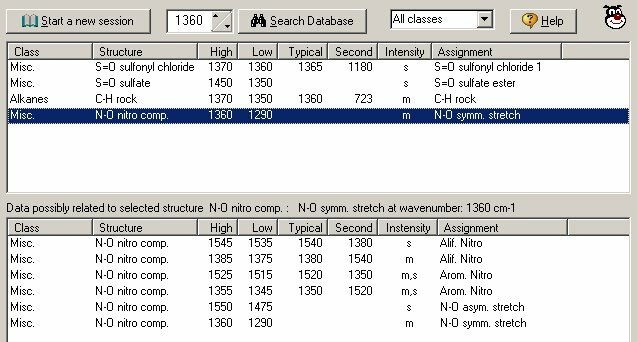 The N-O single bond shows N-O moderate correlation at 1380 cm-1 and at 1350 cm-1. The alky halide shows correlation rated as moderate at 1300-1150 cm-1. The ether shows no correlation. The first amine group shows strong correlation to amines at 3400 cm-1, 1640-1560 cm-1, 1230-1030 and at 910-635 cm-1. The second amine group shows strong amine correlations at 1230-1030 cm-1 and at 910-665 cm-1. The thiocarbonyl shows no correlations. The sulfone shows moderate correlation to the sulfone at 1350-1300 cm-1. 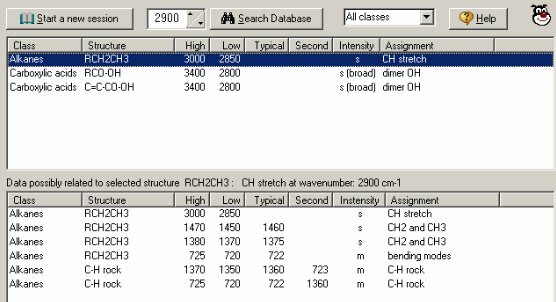 The phospine shows strong correlation in the 2440-2280 cm-1 range. The phosphine oxide shows no additional correlations. The phosphate shows no additional correlations. The carboxylic acid shows strong correlation at 3400 cm-1. The carboxylic acid shows moderate correlation at 1760 cm-1. The carboxylic acid shows strong correlation in the 3400-2800 cm-1 range. The carboxylic acid shows moderate correlation at 1710 cm-1. The ester shows no correlations. No additional correlations for the ester is found. No additional correlations for the carboxylic acid are found. In the case of alkenes, we have a weak correlation at 1660 cm-1 with the alkenes. The mono-substituted aromatic has a moderate correlation with a mono-substituted aromatic at 770-730 cm-1. We also have a moderate correlation with the aromatic at 1592 cm-1. We also have a strong correlation with the aromatic at 1500-1400 cm-1. The meta-substituted aromatic shows moderate correlation to the aromatic at 1592 cm-1. 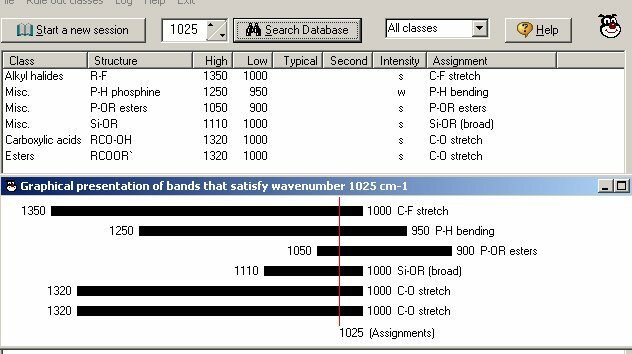 It also shows strong correlation to the aromatic at 1500-1400 cm-1. 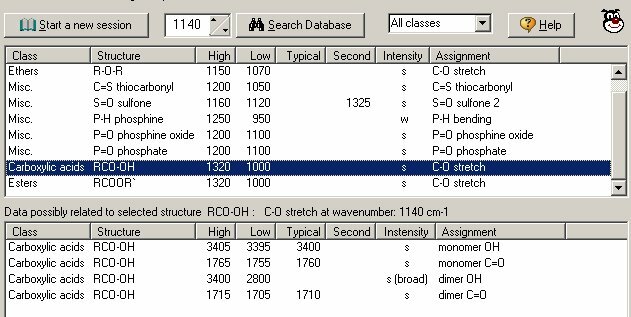 The 1,2,3 tri-substituted aromatic shows moderate correlations to the aromatic at 1592 cm-1 and strong correlation to the aromatic at 1500-1400 cm-1. The 1,3,5 tri-substituted aromatic shows moderate correlation to the aromatic at 1592 cm-1 and strong correlation to the aromatic at 1500-1400 cm-1. The S-OR ester shows no additional correlations. 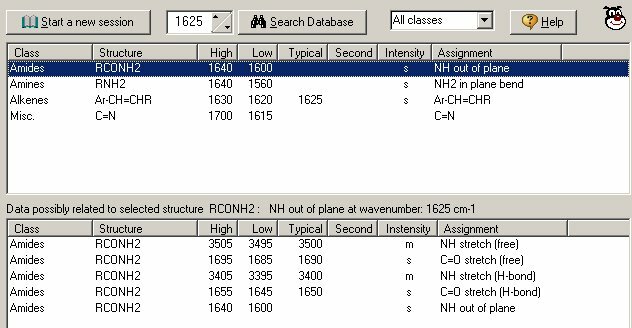 The amine group shows strong correlation to the amine group at 3400 cm-1, 1640-1560 cm-1, 1230-1030 cm-1 (RNH2) and 1230-1030 cm-1 (R2NH). 1. 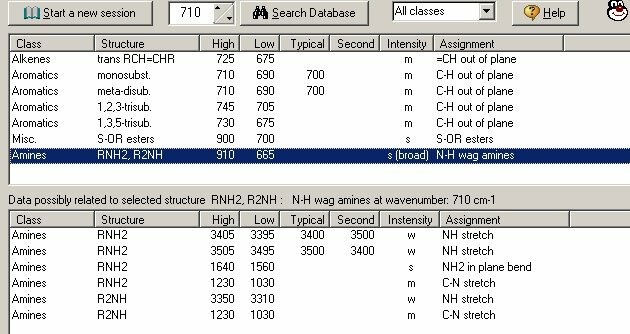 The functional group candidates themselves, as identified with the tabular data from IR Pal as well as additional tables or sources as needed (e.g., Nakanishi). 2. The position of the absorption peaks within the graphical ranges that have been shown above and that accompany these same tabular listings. 3. 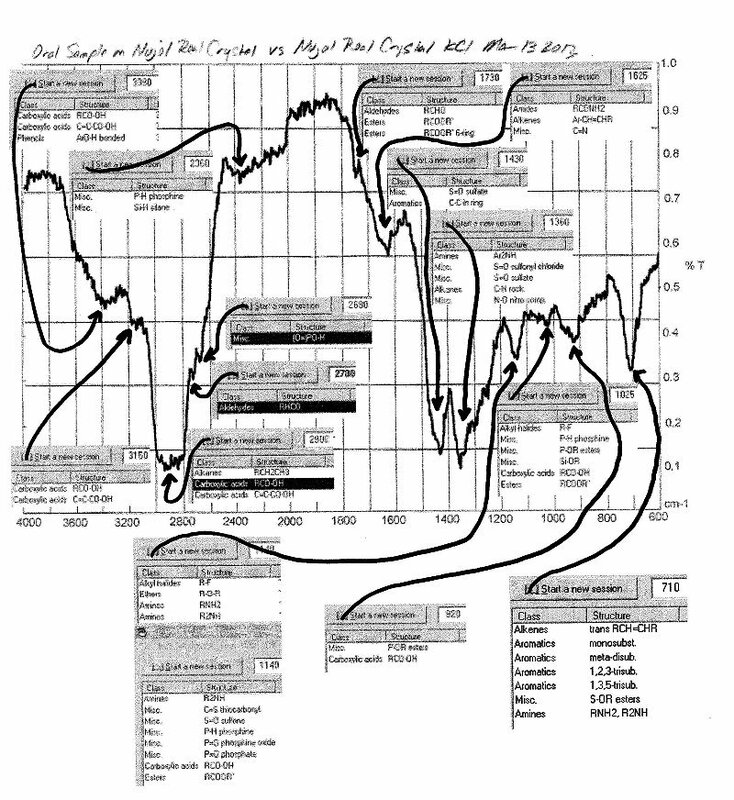 The extensive correlation analysis that is presented above. In addition to having these three sources of information available, a strategy to use them in a sensible fashion will need to be developed. In general, a linear combination of graphical and correlative rankings will be used to integrate and combine this data. 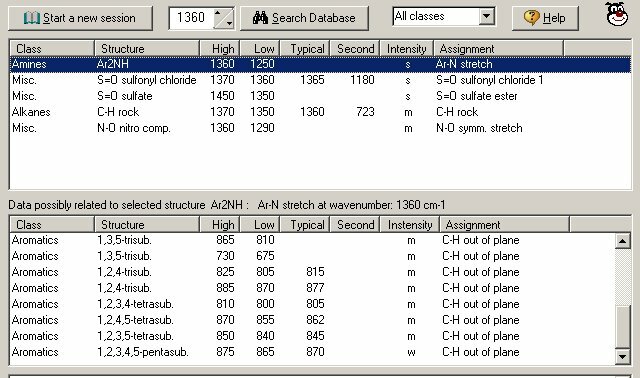 Spreadsheet to evaluate the graphical and correlative weighted contributions to the expected structural composition of the oral filament sample. 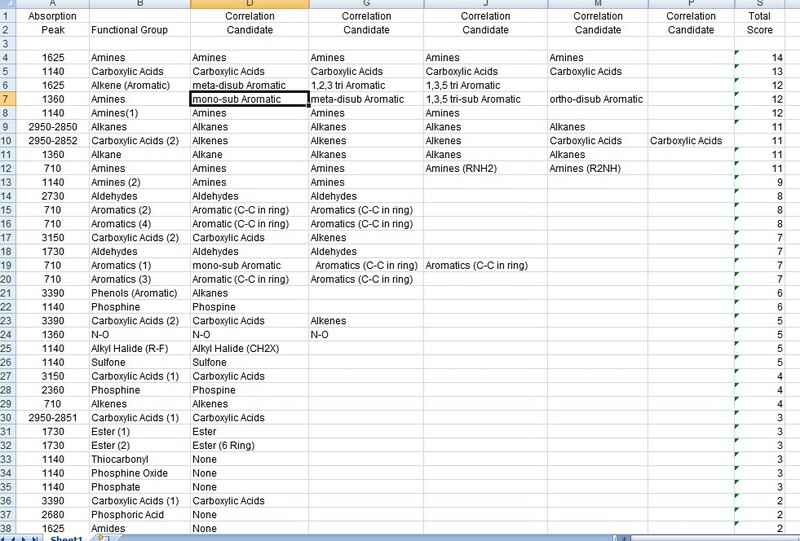 It is the position of this researcher that the above chart reveals, along with the amino acids and iron content previously disclosed, the most probable structural features of the “Morgellons” oral filament sample material. The job remaining before us is to form a more composite picture of this structural whole and the likely and expected health impacts from this same characteristic structure. The culminating discussion is then to bring into consideration various strategies that may be beneficial in mitigating these health impacts and to once again invite the health and medical communities to investigate the veracity of this accumulated research. These issues, to the degree appropriate and possible here, will be pursued. The next step in our work is to investigate the general nature and characteristics of the functional groups that are indicated, at least to the level of probability appropriate to the means and equipment. This basic knowledge of functional group characteristics will be necessary in understanding the assemblage that is to come further down the road in this report. We will progress from the most prevalent to the least prevalent groups. Aromatics are an extremely important branch of organic chemistry, with many ramifications to follow. Organic chemistry can be divided into two main structural forms, that of aliphatic and aromatic organic chemistry. Aliphatic, in a very general sense refers to a chain-like structure and aromatics, in a general fashion, refer to ring based structures. This division is significant, especially with respect to stability and expected chemical reactions to take place. Examples of aliphatics are alkanes, alkenes and alkynes (basically carbon-hydrogen bonds in a chain-like structure)17. An example of an aromatic compound is benzene, a classic six carbon ring structure that many of us have some familiarity with. It is of interest that our category of an aromatic alkane is the next on our list. This alone informs us that we are likely dealing with a combination of both aliphatic and aromatic form, which alone would allow for infinite chemical flexibility from an organic chemistry perspective. For now, our focus will remain on the aromatic aspect of discovery that has taken place. Let us discuss aromatic chemistry in a general fashion. Aromaticity, in general, is used to refer to benzene and its structural relatives. Although this may conjure up an image of a fixed six-ring carbon structure, this level of restriction is not at all appropriate in our understanding of aromatic chemistry. 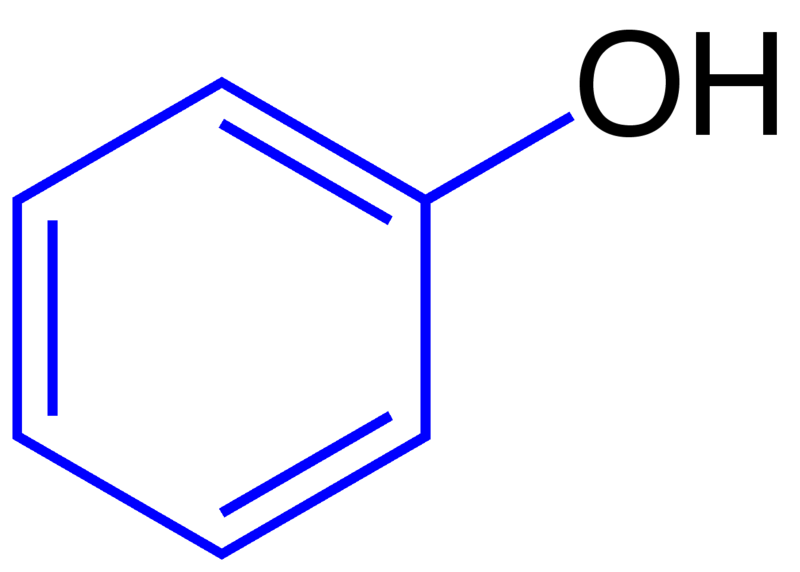 A more formal definition of aromatic is that of a “cyclic conjugated molecule containing 4n+2 pi electrons.”18 We will make some headway into that rather intimidating phrase as we go along, but for now let us work with the classical ring structure in mind and some of the general chemical characteristics of that same benzene structural form. Another feature characteristic of the aromatic is its “conjugated” nature. Conjugation refers to the alternation between single and double bonds in a chemical structure. Conjugation, in general, has the effect of lowering the energy of the molecule and of increasing its stability, an important complementing feature to this same stability mentioned earlier. Benzene is only one example of an aromatic structure; there are an infinite number of variations on this basic theme that will lead to the individual chemistry, i.e., biochemistry, of the form that is under investigation. Benzene by itself is toxic; it leads to bone marrow depression and lowered white cell counts. On the other hand, there are some amino acids in the body that contain aromatic structures (e.g., phenylalanine, tryptophan, tyrosine19). Other examples of aromatic compounds include natural fragrances, steroid hormones, and many drugs such as valium and morphine. The fact that a structure is aromatic is, therefore, not sufficient to characterize its general chemical influence upon the body. We must know more. The presence of an aromatic structure, nevertheless, is one of monumental significance in understanding the expected influences and impact upon human health. The rub will be in knowing how the aromatic structure is modified so that its impact can be more likely assessed with fairness. The identification of aliphatic compounds (that of alkenes in our case, to be discussed separately) in combination with an aromatic structure leaves us with plenty of room for further important discoveries. To begin that process of discovery, we must now look at the types of reactions that are known to occur with aromatic compounds; this is our key to further progress In essence, the use of infrared spectroscopy has opened a very important puzzle for us to solve, and deeper we must now go into this unsolved mystery. The most common chemical reaction with aromatics is that of electrophilic aromatic substitution. What this means, in the most basic sense, is that one of the carbon atoms on the ring gets replaced by “something else.” The nature of the “something else” is crucial to an understanding of the expected chemical and biochemical impact of the filament structure upon human health and biology in general. In response to this need, let us introduce the definition of an electrophile and a nucleophile, respectively. In this diagram, E+ is the electrophile. The electrophile reacts with one of the hydrogens on the aromatic ring and substitutes itself on the ring. The substitution of a halogen for one of the hydrogens. The substitution of a nitro group (NO2) for one of the hydrogens. The substitution of a sulfonic acid group (SO3H) for one of the hydrogens. The substitution of an alkyl group for one of the hydrogens. An alkyl group is formed when one of the hydrogens is removed from an alkane group. An example of an alkyl is a methyl group (CH3-), which is formed from methane (CH4). Alkanes are saturated hydrocarbons with the general formula CnH2n+2. Examples of alkanes are methane (CH4), propane(C3H8) and butane(C4H10). Saturation refers to molecules that have only single bonds, i.e., no double or triple bonds. Alkanes contain only carbon and hydrogen, and all the bonds between atoms are single bonds22. A common term for alkanes is that of paraffins. The substitution of an acyl group for one of the hydrogens. An acyl group has the form RCO-, where R is any organic group. An example of an acyl is the acetyl group, CH3O-. Another variation of an acyl is the case of acyl halides, which has the form RCOX, where X is a halogen, such as acyl chloride (RCOCl)23. Each of these reactions requires certain reagents or catalysts to be present to take place. In human biochemistry, some of these reactions are more likely to be able to occur than others. Let us examine these groups and determine which reactions in the body are less likely to occur than others, thereby simplifying and restricting our scope of probable structural composition. In the description of aromatic nitration24, it will be found that this requires the presence of a mixture of concentrated nitric and sulfuric acids. Since this combination is not likely to be found within the human body, the process will be excluded further from our structural investigation. A similar situation will be found for that of sulfonation25, which can occur in the presence of fuming sulfuric acid. Sulfonation will also be consequently diminished in our further consideration in this investigation, however, we must remain alert to alternative catalysts or pathways whereby a reaction might occur. Aklylation, acylaton and halogenation are expected to occur fairly readily within human biochemistry, and remain under full consideration in our structural analysis. Considerable discussion on the halogenation substitution reactions will take place. Since the group identified most recently within this discussion is that of an alkene aromatic, we must introduce this addition as well. The alkene is an unsaturated hydrocarbon that contains one or more double carbon bonds. The general formula of an alkene is CnH2n and examples include propene and butene. A common term used for alkenes is olefins or olefines. Studying our list of probabilistically ranked functional groups further, the next item mentioned is again that of amines, with an important addition. The presence of the aromatics, this time in combination with the amines in addition to that previously noted for alkenes, must be recognized. This strengthens the case considerably for aromatic biochemistry within our structure. The importance of halogenation substitution within the aromatic group will also be further developed in our discussion as we proceed. We next see the alkanes introduced, and they have already been discussed to some extent. They are a very common organic functional group to be found within organic compounds. They are saturated, single bond hydrocarbons with the general formula CnH2n+2. Alkanes are within the branch of aliphatic organic chemistry, which serves as a chain structure that links many different types of organic compounds together. The carboxylic acids, the alkenes, the alkanes and the amines all repeat themselves subsequently on the list of functional group candidates. This further strengthens their consideration in our structural analysis that is in progress. The next addition on our list is an aldehyde. The aldehyde group has the structure -CHO and can be visualized as follows: The simplest example of an aldehyde is also shown below, that of formaldehyde. The aldehyde group. The R represents any generic organic structure, i.e., an organic variable. An example of an aldehyde, i.e., formaldehyde. We see here that the R group has been occupied by a hydrogen atom. Notice also the combination of an aromatic structure, and aldehyde and halogenation occurring in the presence of an organic acid in the above example of an aldehyde reaction. Our next entries are those of aromatics and substituted aromatics, once again. 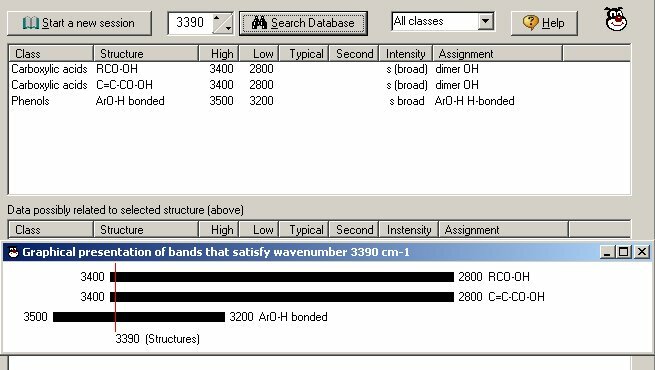 This continues to reinforce the expected importance of aromatics and electrophilic substations in our future discussion of the composite structural portrait that continues to develop within this paper. 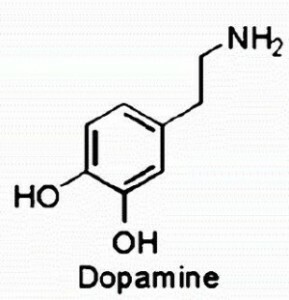 One of the interesting structures involving the phenol group that has arisen within this investigation is that of dopamine. It will be noticed that dopamine is composed primarily of an aromatic ring, a couple of phenol groups attached, and an amine structure at the end of a carbon chain. Dopamine may well have to do primarily with the motivation and drive of an individual; see Eric Matzer’s article : Dopamine is Not About Pleasure Anymore and How Science Evolves. What is of interest here is the importance of the role the relatively simple phenol group can play in the behavior and neural functioning of an individual. 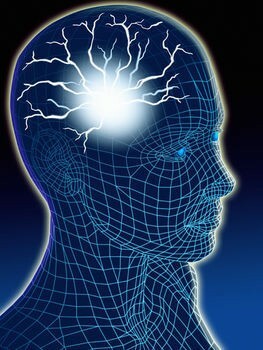 The role of Parkinson’s disease in relation to dopamine will also be worthy of our examination. Lastly, in the future we will examine how a slight tinkering of this molecule can lead to the development of neurotoxins that can easily be expected to seriously interfere with the neural functioning of an individual. More on this issue later. We are approaching the end of the functional group ranking list, at least to the level that we can have a greater confidence in. The lack of repetition of functional groups that is developing is a signal that we should begin to exercise caution in extrapolating our results beyond an expected level of significance. Brief mention will be made of the finalizing set of groups to consider at this time, which includes phosphine, a repeat of carboxylic acids, a nitrogen-oxygen group, and an alkyl halide. Phosphine (PH3) is a highly toxic gas formed by heating white phosphorus in concentrated sodium hydroxide. There is no particular reason to expect this particular compound in human biochemistry and notice no repetition of occurrence of the compound. Carboxylic acids have been mentioned previously and they remain as a primary candidate. Nitro compounds can also not be emphasized in this investigation due to the lack of repetition. The alkyl halides do provoke a level of interest, due to the previous discussion of both alkyls and halogens. An alkyl halide (also known as a haloalkane) is a organic compound whereby one of the hydrogen atoms of an alkane has been substituted with a halogen. Alkyl halides can be formed by a combination of alkanes, halogens and ultraviolet light, in addition to reactions between alcohols and an halogenating agent. One example of an alkyl halide is dibromoethane, CH2BrCH2Br. Many alkyl halides are major pollutants or toxins. They are widely used in flame retardants, refrigerants, pesticides, propellants, solvents and pharmaceuticals. Most alkyl halides are synthetic, but natural sources do exist and they are produced by some bacteria, fungi and algae. 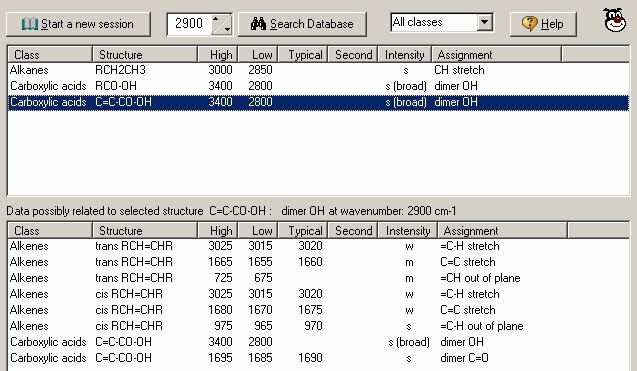 We also note an additional minor absorption peak at 1025 cm-1 that corresponds to the alkyl halides and that increases our interest in this particular group. This completes our list of functional groups that are to be considered in this analysis. The next stage in this project is to collect the information that now besets us, both from previous work and from this current work. Infrared spectrometry will not allow us to define a single finite structure, but it will serve to identify some of the building blocks. These building blocks along with some understanding of the expected biochemistry will end up serving us well for the effort that has been spent. To begin with, let us recall what has been learned from previous work and from alternative methods. We know from previous papers entitled, Morgellons : A Thesis (Oct 2011) and Amino Acids Verified (Nov 2012), that iron and amino acids are core constituents of the biological filaments. These are crucial and important discoveries in their own right. Please be aware, however, that it has taken several years of work to arrive at a point that could have easily been understood and attained within a matter of months with the proper support and resources. Please see Amino Acids Verified, CE Carnicom, (Nov 2012) for additional information on the work leading to the above model. This model depicts an amino acid-iron complex. As with all nutrients that are redirected to support a parasitic or diseased relationship between living forms, this loss of nutrients and energy will be done at the expense of the host. Let us be clear that the human being is the host here, and there can be no expectation other than that of suffering to some degree. In many cases, the suffering is extreme and we all pay the price for this with each day that we allow this situation to pass unchallenged. Time has been spent on discussing the general features and characteristics of each of these functional groups. We must use this information to attempt to create a greater composite picture of our structure involved, and its subsequent expected biochemistry and impact upon human health. 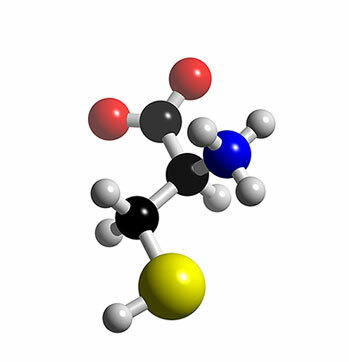 Formaldehyde, one of the most common and important aldehyde groups; known as a preservative. 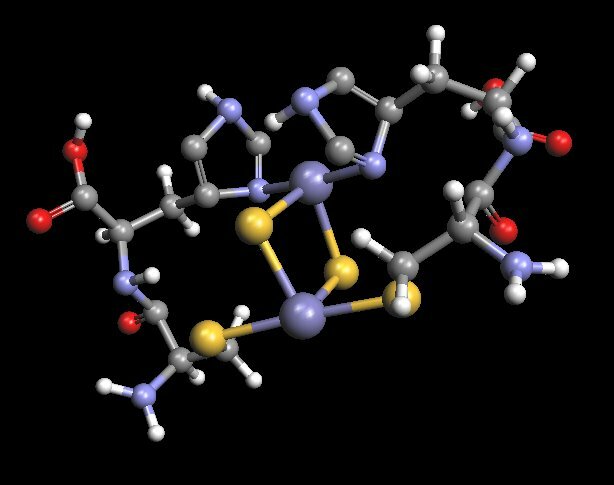 3D Model of oxydopamine, a neurotoxin. Iodine, one of the halogens, crucial to human metabolism. R is any organic atom or functional group; X is any halogen. The halogens are the most reactive elements known. An amino group within the structure of an amino acid..